Productions and artists of Ballet Philippines (BP), the Philippine Educational Theater Association (PETA), and Repertory Philippines (REP) topped the nominations for thirty categories up for grabs in the 2009 Gawad Buhay: The PHILSTAGE Awards for the Performing Arts. Now on its second year, Gawad Buhay is the first-ever industry awards conferred upon outstanding individual and group achievements in the performing arts by PHILSTAGE member-companies. It is judged by an independent jury composed of critics, reviewers, educators, artists and aficionados. With thirteen nominations, BP’s Neo Filipino leads the race followed closely by PETA’s Saan Ba Tayo Ihahatid ng Disyembre? and Si Juan Tamad, Ang Diyablo at ang Limang Milyong Boto with eleven nominations each. REP’s Portrait of the Artist as Filipino weighed in eight nominations to claim the third berth. Other major contenders include Ballet Manila’s Alamat: Gunaw at Sibol, PETA’s Ismail at Isabel, REP’s Sweeney Todd and Tanghalang Pilipinos’s ZsaZsa Zaturnnah Ze Muzikal with seven nominations each. A dance trilogy that pays homage to the vast riches of the Filipino cultural heritage, BP’s Neo Filipino won citations for outstanding dance production; ensemble performance in a dance production; female lead performance in dance (Candice Adea for "Amada"); male lead performance in dance (Biag Gaongen for "Amada" and Ronelson Yadao for "Ulaging"); female featured performance in dance (Marian Faustino for "Amada"); male featured performance in dance (Lucky Vicentino for "Ulaging"); adaptation or translation (Alice Reyes for "Amada"); choreography for dance production (Alice Reyes for "Amada"); musical composition (Kalayo for "Kati-Taog"); costume design (Gino Gonzales for "Ulaging"); lighting design (Katsch Catoy); and set design (Gino Gonzales for "Ulaging"). Tied for second most nominated productions are PETA’s Saan Ba Tayo Ihahatid ng Disyembre? and Si Juan Tamad, Ang Diyablo at ang Limang Milyong Boto. The former is a psycho-emotional journey into the lives, loves and relationships of three people, while the latter is a musical-comedy about the elections and various iconic characters of an imaginary island-state. REP’s Portrait of the Artist as Filipino is an edited adaptation of National Artist for Literature Nick Joaquin’s classic pre-war tale about two spinster sisters and their struggles to maintain residence in their ancestral home with their aging artist-father. The individual categories yielded an exciting mix of nominations pitting veterans versus relatively young bloods. In yet another surprising development, the jury elected to honor lone nominees in outstanding libretto (Vincent De Jesus for PETA’s Juan Tamad), and featured performances in dance (Marian Faustino and Lucky Vicentino for BP’s Neo Filipino). Fernando Josef, president of PHILSTAGE and artistic director of Tanghalang Pilipino, expressed satisfaction at the high level of artistry and steady patronage that performing arts productions achieved in 2009. “Despite the economic and political crises, Filipino audiences have found the time to support Filipino artistic productions, particularly those that mirror present-day realities,” quipped Josef. PHILSTAGE is the country’s only organization of professional performing arts companies with a regular season programming of repertory development and performance pedagogy training. Its Board of Directors include PETA's Melvin Lee, vice president; Ballet Philippines’ Sandy Hontiveros, secretary; Repertory Philippines Gidget Tolentino, treasurer; Actors Actors’ Leonardo Lim, Ballet Manila's Susan Macuja, Gantimpala Theater Foundation’s Tony Espejo, Organisasyon ng Pilipinong Mang-aawit’s Mitch Valdes, TRUMPET's Joel Reyes, and PHILSTAGE Executive Director Elmar Beltran Ingles as members. 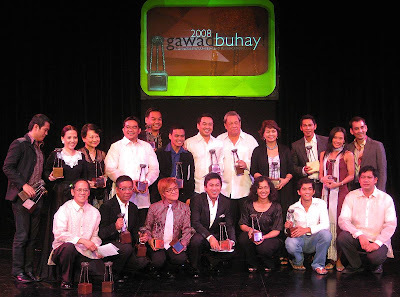 The 2009 Gawad Buhay jury is composed of Exie Abola, Walter Ang, Gilbert Cadiz, Ronald Elepaño III, Arvin Ello, Ralph Semino Galan. Rolando Inocencio, Glenn Sevilla Mas, Joy Parohinog, Joey Ting, and Basilio Esteban Villaruz. As jury members, they were deputized to watch all productions of PHILSTAGE member-companies throughout 2009 and held deliberations to come up with quarterly citations and the final nominations. REP’s A Portrait of the Artist as Filipino, TP’s Madonna Brava ng Mindanao and Mga Mansanas sa Disyerto/Apples from the Desert, and PETA’s Saan Ba Tayo Ihahatid ng Disyembre? Lamberto Avellana, Jr. (REP’s Portrait of the Artist as Filipino), Aries Alcayaga PETA’s Saan Ba Tayo Ihahatid ng Disyembre? ), Gie Bernardo (PETA’s Ismail at Isabel).